» Left angled backing in, still too weird? Left angled backing in, still too weird? Outside the Albany Post Office in the early afternoon on Monday. 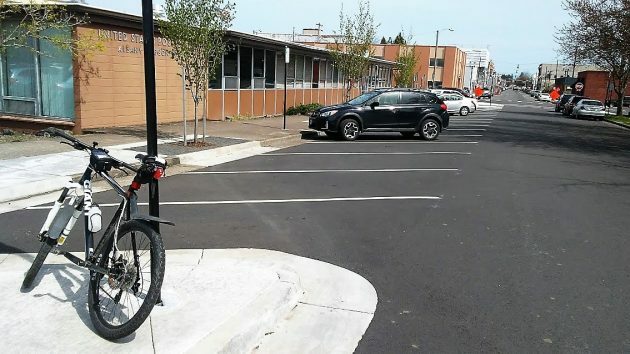 Still not completely catching on, is it, this required back-in parking on the left side of one-way Second Avenue on the south side of the post office. In any case, as we can see here, visitors to the post office do not necessarily follow the signs that say “back-in parking only.” That may be because in compact cars with a short turning radius, it’s just as easy to turn briefly to the right and then swoop left into one of the spaces nose first. I think the parking at the Post Office is stupid and unnecessary,. What the city should do is listen to valid objections and opinions of the people, admit this is a mistake, and change it to head in parking. Ahhhh, finally some clarity on backin parking. Rightside backin isn’t much different from rightside parallel. The sightline advantage is clear. Agree! I’d have been happier with head-in diagonal parking if it was really necessary to make the extra spaces available near the post office. I wonder whether those who successfully negotiate the left angled parking all have dashboard camera displays to assist them. I tried the experience once (with no camera display) and needed a couple of readjustments to be semi-successful. That doesn’t make for greater traffic safety, nor better traffic flow. so you pull down the one way street and then have to backup into traffic to get to your parking spot. I’d like to see this go into the Oregon DMV handbook for your drivers test, as well as make it part of your drivers test route. That was my thought. A crash waiting to happen. Let’s take a breath. Old fashioned parallel parking requires a driver to stop (and impede traffic) before wiggling into the parking slot. So backing toward traffic isn’t new. I avoid left-side parallel parking because I didn’t practice it enough to be competent. STUPID STUPID STUPID….WHOEVER DESIGNED IT NEEDS OUSTED FROM OFFICE!! I was through here the other day…and I figured out why people are still parking wrong here…..That little section of road is still a two way street (at least I didn’t see any one way signs. Anyone who turns west on 2nd from Washington has no other choice but to park “head in”. Once it’s a one way going the other direction (east)…the only logical choice on that side of the street will be to back in as intended. Google Street View from August 2017 shows one-way signs attached to both stop signs facing Washington St. at 2nd Ave, an east-facing “Do Not Enter” sign on 2nd Ave. east of the first parking space (clearly visible from the intersection), and another such sign at the nearby exit of the Post Office parking lot. I don’t know if anything has changed since then. The only thing wrong(?) is that the east-most handicapped space didn’t have ramp access on the driver’s side, but there were construction signs and maybe they were working on it. It also shows 6 cars angle-parked plus one car pulling out, all correctly, but one with wheels over the line. And it shows lots of alternative spaces for those who don’t want to deal with backing-in. As always and everywhere, far too much impervious surface to store and move private cars, but never enough for some people.